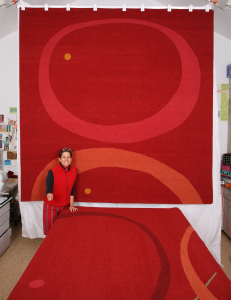 This month we interviewed Alicia Keshishian from Carpets of Imagination to learn more about her interaction with color in her work. You clearly love color. What is your approach for mixing hues in your colorful designs? My colors are driven by intuition which comes from years of color play. If my heart flutters and skips a beat or if my mouth starts watering, then I know I’m on the right track. Color ways are like little stories. What is the story necessary for any particular job? What do the colors say and how does that relate to the client and their needs? Because my carpets are custom, I listen to my clients. 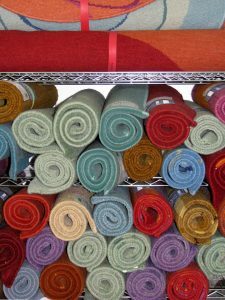 They are the ones that will live the rugs day in and day out, so it’s critical that the client is happy. If they have colors which don’t resonate for me – it’s my challenge to find a way to make it work. I need to find a color palette which elevates that color so it sings. I need to determine a common language so the colors talk. Personally I’m drawn to monochromatic and analogous palettes with a curveball thrown in for excitement. My palette naturally leans toward bold, saturated colors. Reds with oranges and purples always pleases me. I love a predominantly cool palette or a warm palette. Inspiration is a crucial part of maintaining fresh, creative work. What are some of your favorite methods to recharge your creative batteries? Travel and nature are what drive me to create. Being outside opens up possiblities. Being in a new location forces me to see differently. It might just be the light. It might be sounds. I love an unexpected encounter. Specifically tropical waters are what excite me. That clear blue water that is home to colors and textures beyond the imagination are such a thrill. Diving … wow. Talk about textures! How do you work with clients to create style and color harmony in their space? My job is to meet a client – then look and listen. Quietly I process all the information I take in. Often it’s simply observing their personal style and what they have to offer consciously or unconsciously. What is the intention? What is needed? Is the room a sanctuary? Does the space need energy? If a client is unsure how to navigate, I’ll ask for a list of words. Serene. Loud. Bold. Modern. Whimsical. etc. Then I go through the process of interpreting these words into a story which then translates into a design and color direction. Is the carpet intended to be a focal point? Is the carpet a foundation for the other elements in the room? Does the client want the carpet to be the first, second or third thing someone will see when walking into a room? Everyone has a color palette. I start there. I try to determine which color will be the dominant color. Which colors will be the accents. Where is the surprise? I play with the reflective qualities of silk for an elegant or playful effect. If I client is working with me they already know my style – so I combine all the information to create a story which resonates for them. What are some common mistakes you see people making with color? Fear of color is such a common problem. People are afraid of color so they choose dull neutrals. Lack of confidence drives people to dull and boring beiges or grays. That makes me so sad. Combining clean and dirty colors. Pastels from one family in concert with bold saturated colors from another family – yuk. Though I know it’s popular and currently trending it continues to challenge my aesthetic. Using colors with the wrong undertones can be disastrous. You have such a rich history of textiles, color, and textures. Tell us more about that. I was raised in a family with artists all around. Color was very important on a daily basis in my house. My mother fearlessly dyed anything and everything. One of my earliest memories is of my mother dying my white cotton Buster Brown underwear to match my clothes. No boring white underwear in our house! Happily I have inherited that fearlessness. I love to dye fabric and a day in my studio painting or dying fabric is always a good day. What do you love about working in a creative industry? People that are willing to challenge the norm and question what is expected – it takes courage. That courage spills out into their work and their lifestyle. It’s exciting and is usually infectious! When creative people get together the sparks fly and the results are usually dynamic. Alicia Keshishian is Owner and Creative Director of Carpets of Imagination and Chroma*licious. She is an award-winning designer with more than 35 years of professional experience as an art director, graphic designer, surface designer, illustrator, and color consultant. Although she works with clients world wide she has been based in New York City, the San Francisco Bay Area, and Asheville, NC. She holds a BFA in Design/Illustration from CCAC and was an artist-in-residence at The Penland School of Crafts in North Carolina. 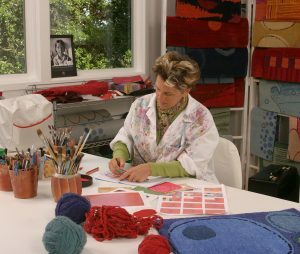 She currently produces a line of custom, handmade-to-order carpets and is a popular speaker, lecturer, and presenter on design and color. CMG Members can connect with Alicia through the Member Online Forum or CMG’s Members’ only Directory. Fabulous, what an inspiration!!! Ms. Keshishian is uber talented and has a wonderful approach to color and customer service. Anyone who has a carpet that she designed and created is most fortunate. Billy B. You continue to be an inspiration. Your fabrics and carpets are fresh and timeless.